Huskisson Nsw Accommodation Huskisson or "Husky" as it's colloquially known is the hub for some of the most popular attractions on Jervis Bay. Whale and Dolphin watching cruises on pristine Jervis Bay depart most days weather permitting, to watch the Dolphins and Southern Wright and Humpback whales perform their acrobatic displays and are an awe-inspiring thrill to watch. Situated in the midst of a Marine National Park, Huskisson takes full advantage of the Coastal views out to Point Perpendicular, the sun, surf and sea atmosphere. The relaxed style of Huskisson is further enhanced by many Cafes, Restaurants, Clubs and Pubs with the weary traveller having the choice of numerous side-walk Cafes to simply take time out and enjoy the casual sea side experience. For the more energetic or when you have had time to unwind there are cycleway along the beaches, kayak, canoe and bicycle hire, Bush walks through nearby National parks or simply stroll along the unspoilt white sand beaches at sunset. A meal of fresh local seafood eaten on the wharf at sunset is a must to enjoy in Huskisson. 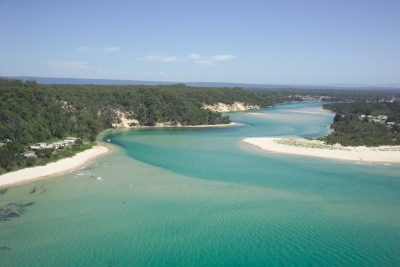 Jervis Bay Accommodation properties are privately located in Vincentia, Huskisson, St Georges Basin, Sanctuary Point, Hyams Beach, Worrowing Heights, all close to the famous white sandy beaches of Jervis Bay, most diverse selection of new, high quality beach, farm/nature and lake stay locations at Jervis Bay at our 1, 2, 3 and 4 bedroom properties. Ideal for couples, groups, families, weddings and functions. Choose from a unique collection of beach bungalows, sea shacks, lake huts, country houses or romantic cottages for couples.